Scorpio is a 32 channel, 36 track mixer-recorder and the most powerful product ever designed by Sound Devices. 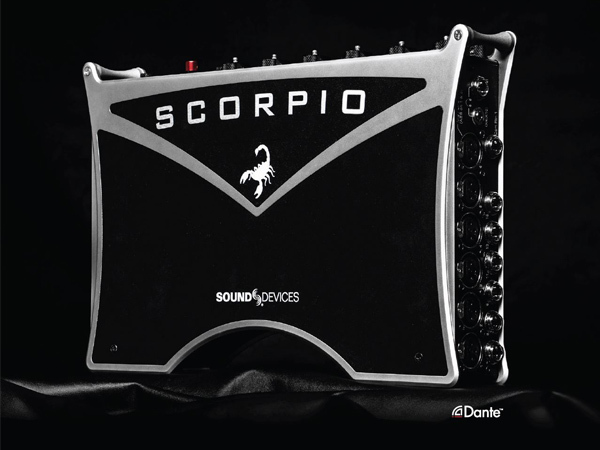 With 16 mic/line preamplifiers, 32 channels of Dante in and out, AES in and out, 12 analog outputs and multiple headphone outputs, Scorpio is well-suited for any production scenario. Featuring a fully-customizable routing matrix, ultra-low noise preamplifiers, multiple powering options, a premium-quality build equally useable over-the-shoulder or in a mobile rig, high-powered processing, and an internal 256GB SSD with two SD card slots, Scorpio is the ideal tool for a new era of production sound. NEW FIRMWARE RELEASE: New Audio LTD A10 Wireless v2.50 Firmware release with new User Groups!